What’s the Right Kitchen Layout for You? 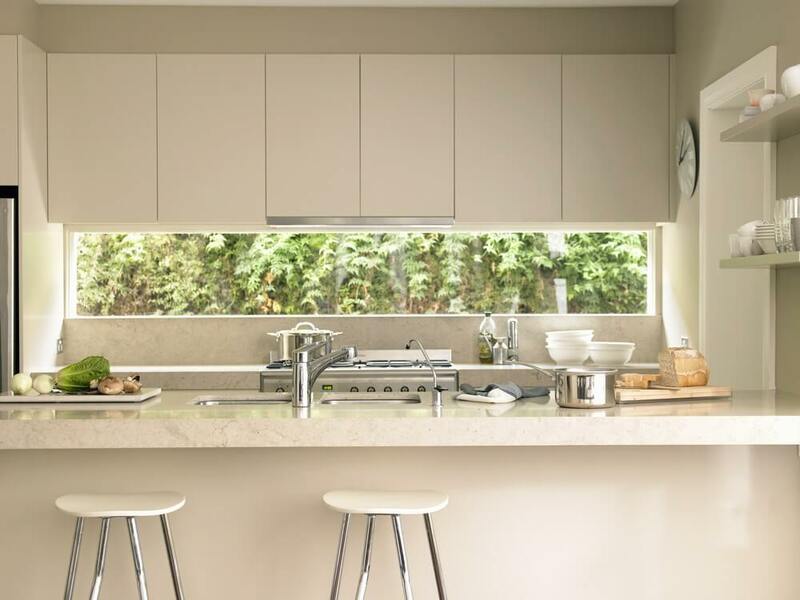 The success of your next kitchen renovation starts with choosing the best kitchen layout. Implementing the correct one ensures that your kitchen is in sync with the rest of your home. 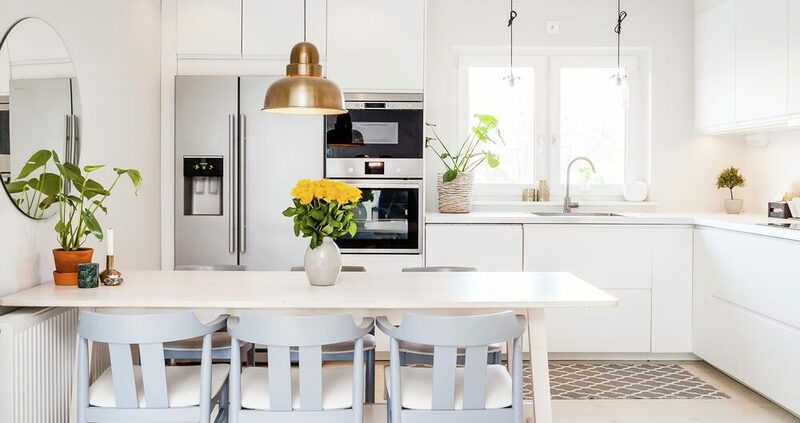 Here, we will show you the six popular kitchen layouts. Familiarise yourself with each layout so you can choose the right one. We included sample floor plans so you can see the ideal positions of the sink, stove, and the refrigerator. These three areas form the work triangle. The trip from one point to another must be quick and uninterrupted to consider the kitchen efficient. 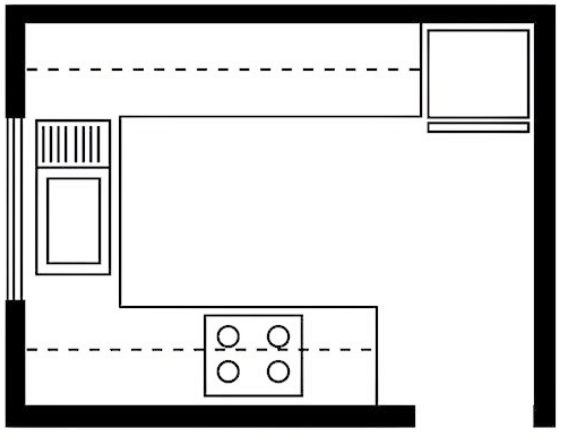 A basic one wall or Pullman kitchen layout, showing the best position of the sink, range, and refrigerator. 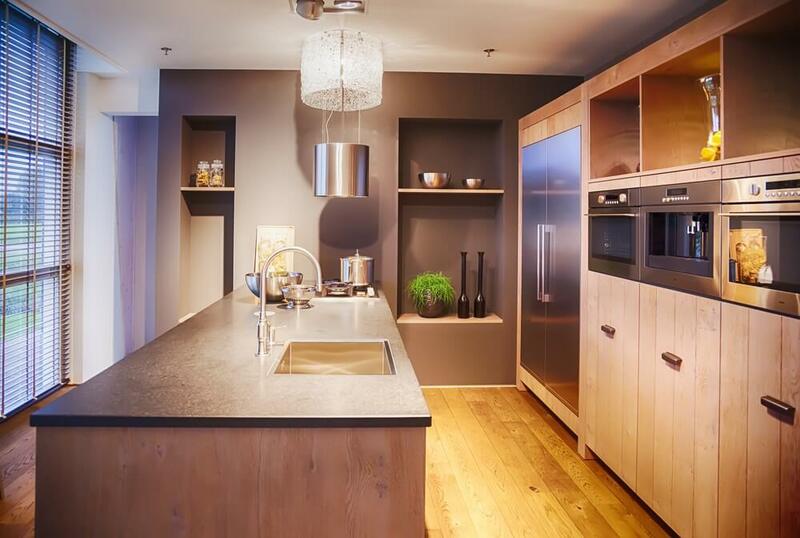 If you live in a studio or loft apartment, this is the kitchen layout for you. Here, you fix the cabinets, sink, range, and refrigerator together on a single wall. It’s the ultimate space saver! 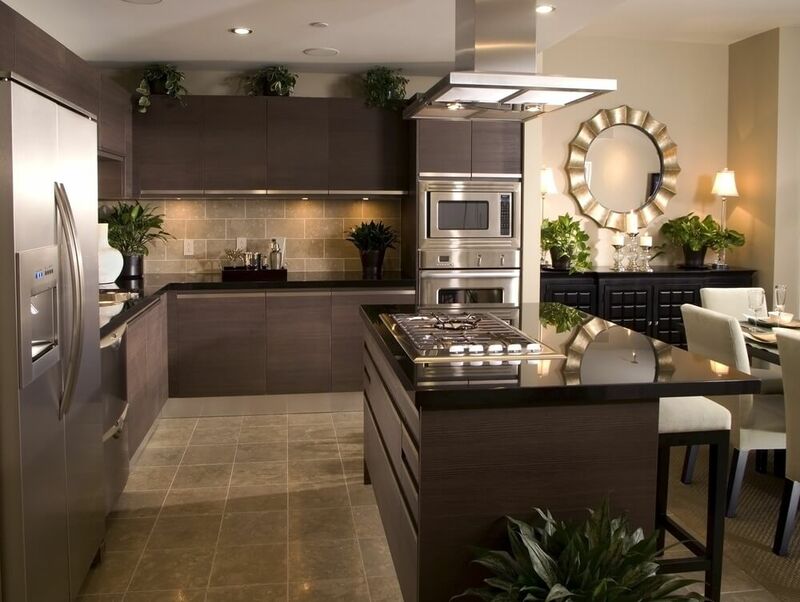 Superdraft tip: Add an island to give the one-wall kitchen a “galley” feel. Station the sink or the range in the island to make the kitchen ergonomic. 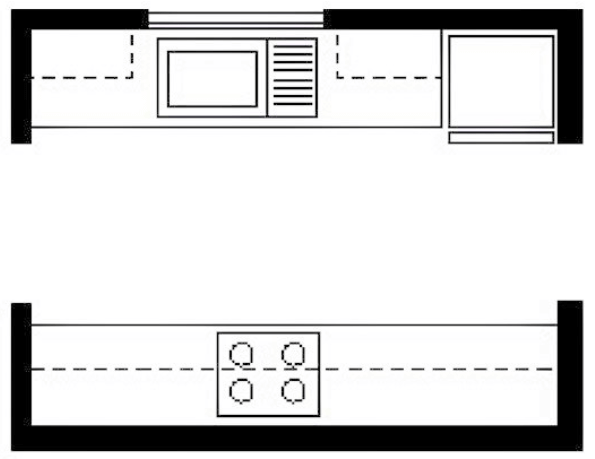 A basic galley kitchen layout, showing the best position of the sink, range, and refrigerator. Named after the compact galley of ships, this lean layout is ideal for long, narrow, and rectangular kitchen spaces. 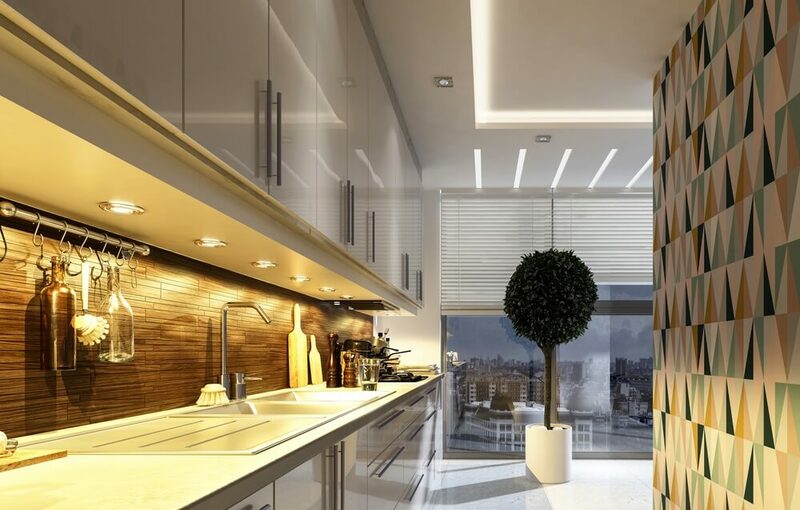 It consists of two parallel countertops which create a work corridor in between. The layout aims to divide a space efficiently to create enough storage and workspace. Aside from cupboards and drawers, you can create additional storage in a galley kitchen. Build an alcove storage or screw floating shelves to that closed-off kitchen wall. Superdraft tip: Want to save money on your cabinetry? Avoid corner cabinets in your galley kitchen. The cost of your cabinetry will be cheaper when you use standard sized cabinets. 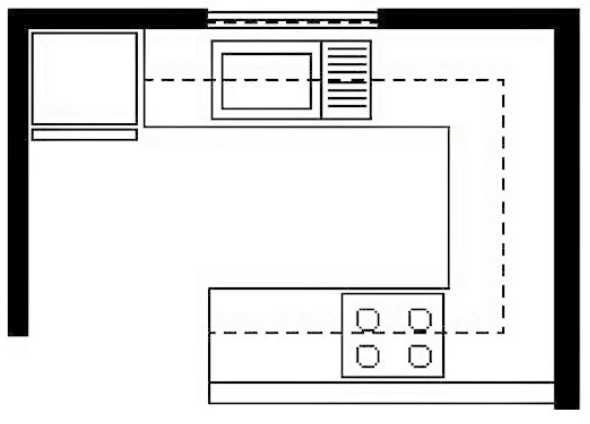 A basic L-shaped kitchen layout, showing the best position of the sink, range, and refrigerator. The L-shaped kitchen is a versatile and smart layout for small to medium-sized spaces. It is characterized by two perpendicular countertops which form a letter “L”. The length of the legs depends on the size of your kitchen, but we recommend to keep it shorter than 12ft. to maintain its efficiency. Superdraft tip: Incorporate a dining table or a breakfast bar in an L-shaped kitchen. However, we discourage configuring this layout if multiple cooks will use the space. The original L-shape will help you manage the traffic. A basic horseshoe kitchen layout, showing the best position of the sink, range, and refrigerator. 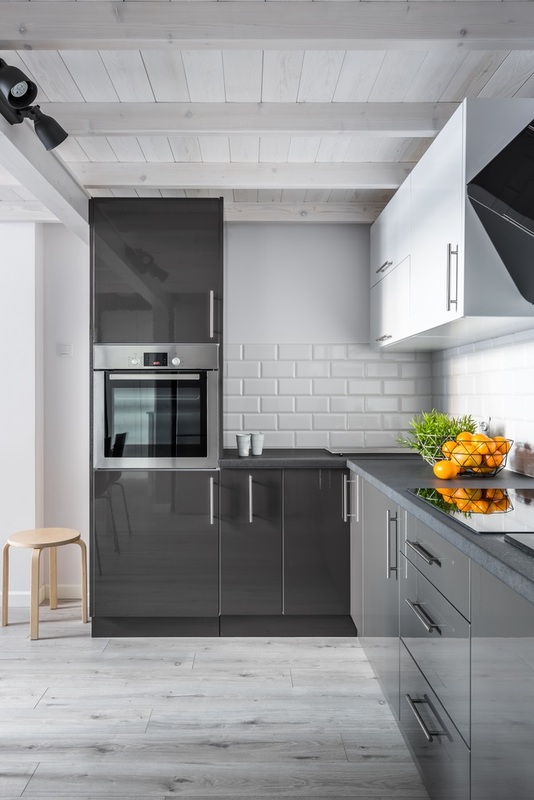 Having three walls of cabinets, appliances, and countertop space, the horseshoe or the U-shaped layout can accommodate more cooks in the kitchen. It’s best for medium to large kitchen spaces. Superdraft tip: Add an island to your U-shaped kitchen to help you manage the traffic and workflow in the space. It creates two entry and exit points, plus the some of the work will concentrate there. 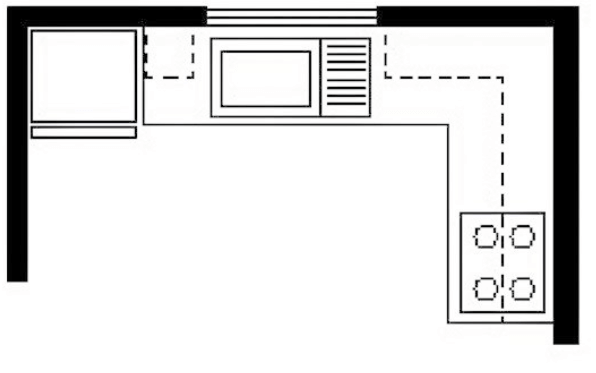 A basic peninsula kitchen layout, showing the best position of the sink, range, and refrigerator. The peninsula layout happens when you extend your L or U-shaped kitchen with a kitchen island. It can house the sink or the range. The island can also serve as a breakfast bar. 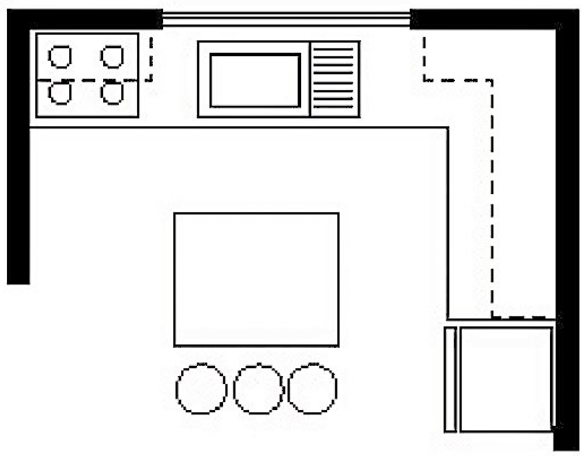 A basic island kitchen layout, showing the ideal position of the sink, range, and refrigerator. Unlike the peninsula layout, the kitchen island in this layout is separated and located in the centre of the kitchen. 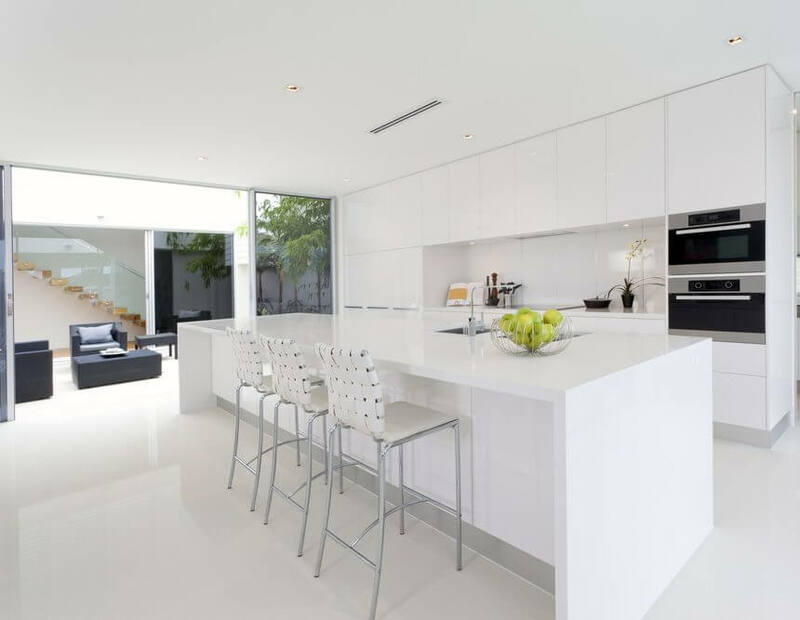 The size of the counters must be large enough to hold the sink or the range. It also functions as a breakfast bar and an additional work surface. It may include drawers, cupboards, or appliances too. Superdraft tip: It is important to have enough clearance to make this kitchen layout possible. 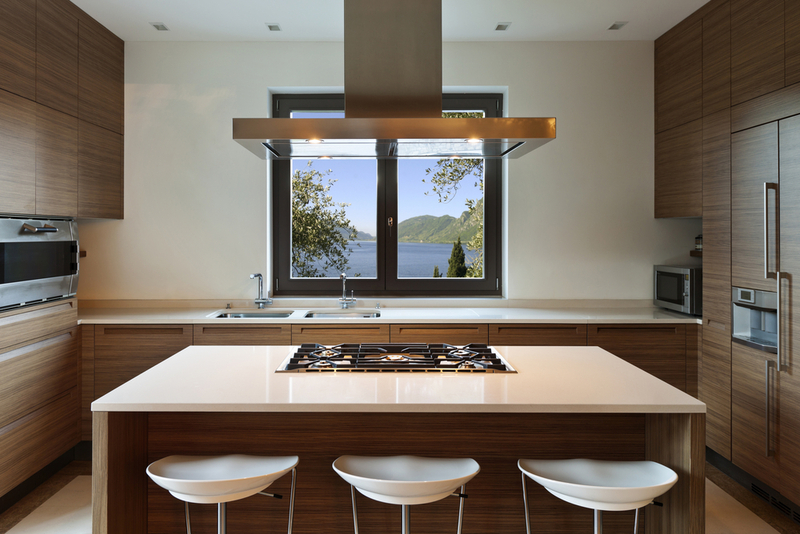 If your island kitchen design and measurements do not comply with the local building codes, you can’t build it. 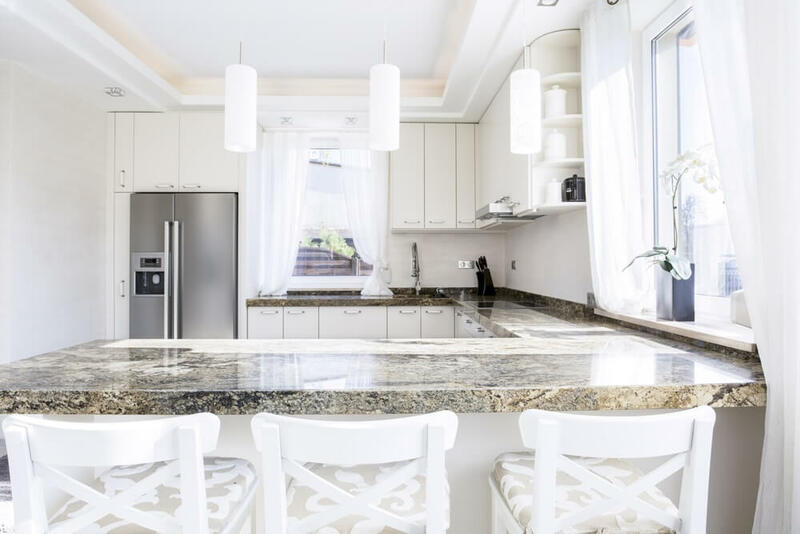 Your kitchen layout and configuration is best identified after an on-site design consultation. Our people can help you design your dream kitchen. Leave us a message using the form above and we’ll get back to you ASAP!